The ROY family lived locally in St James Road. James Roy was a housepainter. He came from Edinburgh. His wife Martha may have worked for Collins the printers before her marriage. She had been brought up in the Drygate close to the Glasgow Necropolis. Her father, John BARR, was a calenderer or clothlapper in the mills. James and Martha’s eldest child was their only son, Alexander. They had 5 daughters, Martha, Catherine, Mary, Jemima, and Anna. The headstone was probably commissioned by Martha and Mary who lived with their mother, Martha ROY until her death in 1946. The grave is close to the Wishart Street gates. It is the 9th on the left as you walk up the path towards the bridge from there. The first to be buried in this lair was Alexander Roy. He died on the 19th April 1898 at the age of 18 in Glasgow Royal Infirmary. The cause of death is given as Bright’s Disease but it is possible that this diagnosis was wrong and that he died from Weil’s Disease (leptospirosis). His death followed an accident when Alexander and a friend had been fooling about at the Forth and Clyde Canal. Alex fell in. His friend, a nephew of Professor Glaister of Glasgow University, fished him out and took him to the Glaister home where his clothes were dried before he returned to his own home so that his family would not worry about what had happened. Infection and death followed. Alexander was buried in the Glasgow Necropolis on 21 April 1898 . 5 years later Alexander’s father, James ROY died too at the age of 50 as a result of a fatal accident. He was killed while painting the Council Hall in Municipal Buildings (City Chambers) in preparation for a visit by the King Edward VII and Queen Alexandra on 14 May 1903 . The main purpose of the visit was to lay the foundation stone of the new building of the Glasgow and West of Scotland Technical College which later became the University of Strathclyde but, among other engagements, they attended a luncheon in the City Chambers. A Fatal Accident enquiry was held and the entry in the Register of Corrected Entry, issued by the procurator fiscal’s office on 10 August, 1903, noted that a jury had determined that he had died as a result of injuries sustained the same day when he overbalanced and fell from a plank to the ground about 14 feet below. 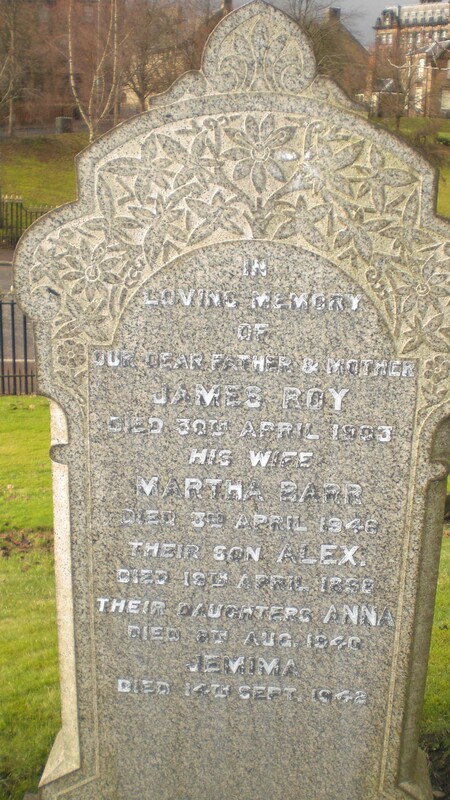 James ROY’s wife Martha lived to the age of 92. She died on 3rd April 1946 at her home in Dennistoun. She too was buried in the family lair in the Glasgow Necropolis. The headstone is also in memory of two daughters of James and Martha. They were both buried in Providence, Rhode Island, USA. Anna, the youngest daughter, married an army officer, George Edward Miller during WW1. Sadly he did not survive the war. Anna was left with a pension which gave her independence. She emigrated to the USA where she became social secretary to a wealthy socialite in Rhode Island. Her sister Mima, emigrated later. She had worked in Glasgow as a dress designer for Dalys’. In the States, she designed clothes for Macey’s in New York. Both sisters died from breast cancer in their 40s.